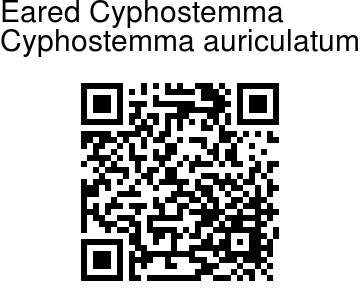 Eared Cyphostemma is a large climber with densely velvety branches. 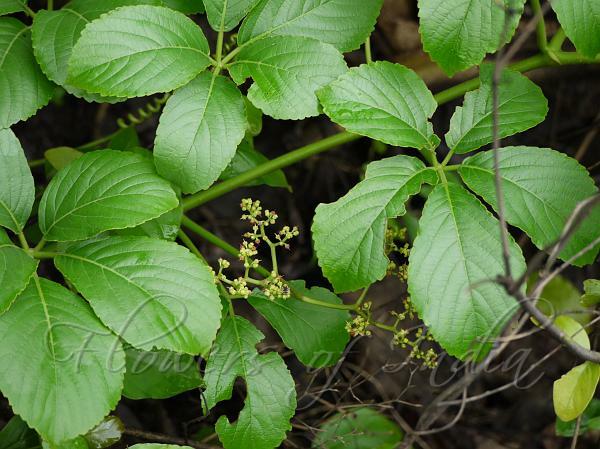 Leaves are palmately divided into 5 leaflets. Leaflets are obovate, 6-14 cm long, 2.5-7.5 cm wide, with a wedge-shaped base and toothed margins. Leaflets end in an abruptly pointed tip. Flowers are greening cream, borne in flat-topped clusters which are carried on long stout stalks, which are longer than the leaf stalks. Sepals cup is 0.5 mm, with 4 sepals. Petals are also 4, green, ovate-lanceshaped, 2.5 mm long. Fruit is a 1-seeded red round berry, 1.2 cm across. is found in the Eastern and Western Ghats. Flowering: June-October.